Having run the biggest festival of its kind south of the border for over a decade, organizers behind Maryland Deathfest are now bringing the metal madness to Montreal for a new event this fall. Ahead of time, they've unveiled the first round of bands set to play the inaugural Quebec Deathfest. 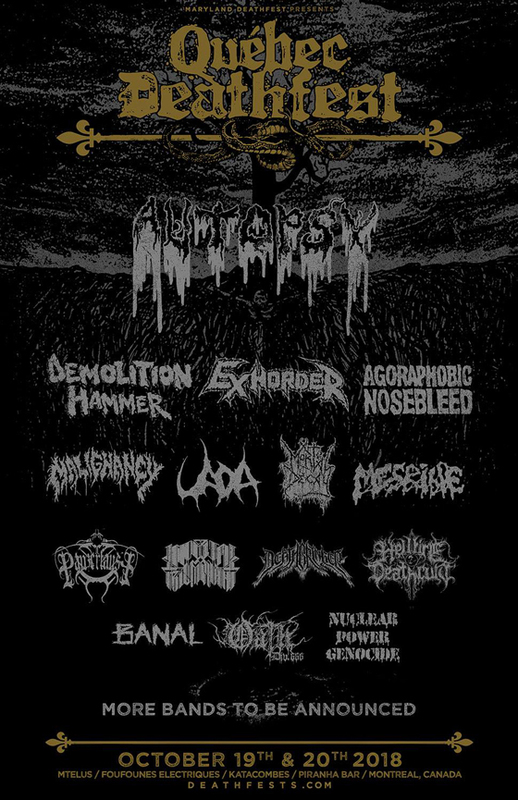 California death metal icons Autopsy lead the first announcement, followed by Demolition Hammer, Exhorder, Agoraphobic Nosebleed, Malignancy, Uada, Mortal Decay, Mesrine, Hellfire Deathcult, Panzerfaust, Imperial Triumphant, Deathbringer, Oath Div. 666, Nuclear Power Genocide and Banal. More bands are also set to be announced. Quebec Deathfest's inaugural edition will take place October 19 and 20 at Montreal venues Mtelus, Foufounes Electriques, Katacombes and Piranha Bar. A two-day, all-venue pass is set to go on sale at 12 p.m. EST today, and you can find further information on here. Further ticketing options will be released upon completion of the lineup.